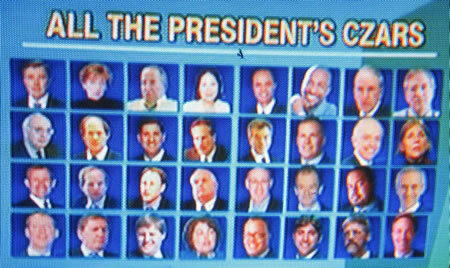 House Republicans introduced a bill today to eliminate Obama’s 39 czars. A group of House Republicans introduced a bill on Wednesday to rein in the various “czars” in the Obama administration. Rep. Steve Scalise (R-La.) and 28 other House Republicans introduced legislation to do away with the informal, paid advisers President Obama has employed over the past two years. The legislation, which was introduced in the last Congress but was not allowed to advance under Democratic control, would do away with the 39 czars Obama has employed during his administration. The bill defines a czar as “a head of any task force, council, policy office within the Executive Office of the President, or similar office established by or at the direction of the President” who is appointed to a position that would otherwise require Senate confirmation.